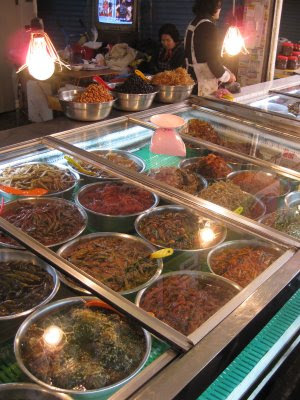 As places go, Jukdo market is one of Pohang's most colorful. 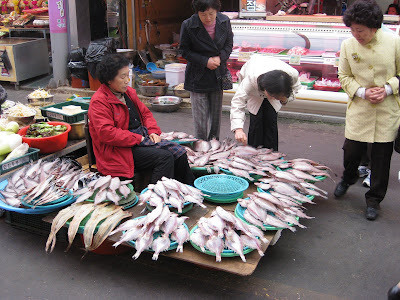 Its largest market, Jukdo is a popular destination for Koreans in search of some of the country's freshest seafood. It's all freshly caught - after 6pm each day the fishmongers start discounting their stock. But they have much more than fish to offer. 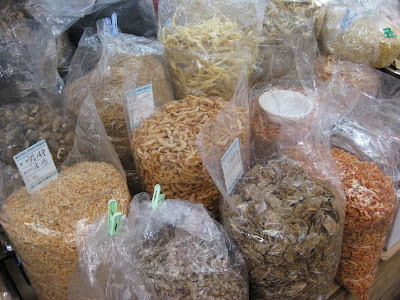 Clothes, kimchi, side dishes, linens, plants: you name it, you can probably get it here. It's a colorful place, where vendors gut their catch under rainbow umbrellas and old women jostle for dried shrimp in crowded alleys as motorbikes zip by. 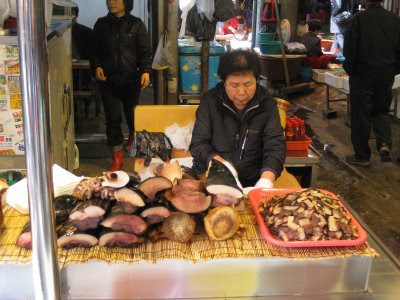 Sitting catycorner to each other, two women compete for business selling whale and dolphin meat. 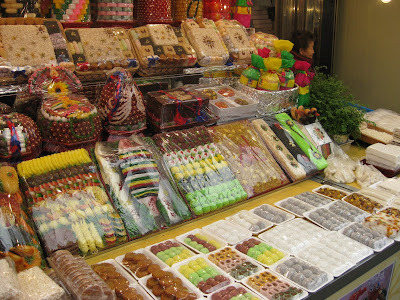 But competition isn't fierce; they are the only two vendors of their goods in Pohang. One woman is slicing a large hunk of black meat encased in a strip of lard as thick as the meat itself. She offers us a slice - whale, we're told - and we eat it with some salt. It has a unique, very rich flavor, like dark coffee or chocolate. Afterwards she changes her tune - it's dolphin. I feel uneasy knowing what I ate, but I can't decide why. Dolphins are intelligent, supposedly compassionate, and playful. If they were smaller or drier they'd make great pets. They're innocent - but so are whales, and every other animal we eat, for that matter. For some reason it seems more plausible to me that a dolphin could possess a soul, I suppose. They're the most human of sea creatures. Maybe it's a classic case of anthropomorphic attachment. It's irrational and doesn't make sense. Still, I feel uneasy. My coteacher later tells me that whaling is illegal in Korea - they're only allowed to sell whale or dolphin if it is caught in their nets inadvertently and is already dead, or if they import it. I can only speculate as to the laxity of enforcement. Unfortunately, at times Jukdo market can be so colorful that it hurts to look. More uneasiness, this time not out of an affinity for anthropomorphism but general sense of inhumanity. Afterwards, while I try to calm my mind and my suddenly-queasy stomach, my coteacher brings me a large bag of boiled, dried octopus chips. I thank her politely and put them in my bag.